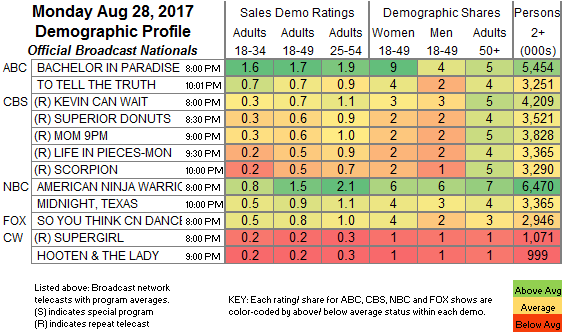 NETWORK FINALS: BACHELOR IN PARADISE and the rerun of TO TELL THE TRUTH swapped 0.1 in final numbers, with BACHELOR up and TRUTH down. CABLE HIGHLIGHTS: USA’s WWE telecast was again on top of Monday cable at 1.17/1.16/1.15, compared to last week’s 1.21/1.14/1.10. On VH1, LOVE & HIP-HOP gained 0.02 to 1.08, and BALLER WIVES was down 0.03 to 0.60. MTV’s TEEN MOM fell 0.13 to 0.65, and SIESTA KEY was up 0.04 to 0.29. On Bravo, REAL HOUSEWIVES OF ORANGE COUNTY rose a tenth to 0.64, and REAL HOUSEWIVES OF DALLAS ticked up to 0.27. On TBS, AMERICAN DAD climbed 0.02 to 0.52, and PEOPLE OF EARTH ticked up to 0.31. 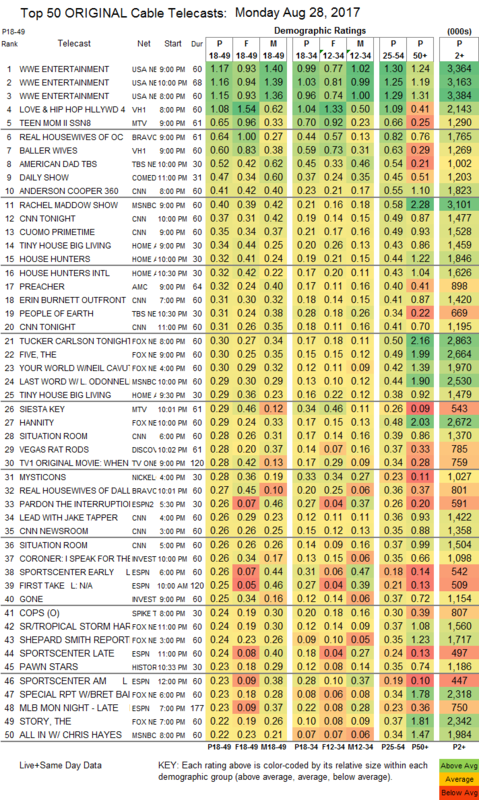 Comedy Central’s THE DAILY SHOW had an unusual slot in the Top 10 at 0.47. It was CNN on top in cable news, with ANDERSON COOPER 360 at 0.41/1.8M, above MSNBC’s RACHEL MADDOW SHOW at 0.40/3.1M, and Fox News’s TUCKER CARLSON TONIGHT at 0.30/2.9M. On HGTV, TINY HOUSE BIG LIVING was at 0.34/0.29, compared to last week’s 0.31/0.27, HOUSE HUNTERS was at 0.32, and HOUSE HUNTERS INTL was up 0.04 to 0.32. AMC’s PREACHER ticked up to 0.32, and LOADED (which has been pushed out of primetime) was down 0.02 to 0.02/127K. Discovery’s VEGAS RAT RODS dropped 0.04 to 0.28. On ID, THE CORONER dipped 0.02 to 0.26, and GONE ticked up to 0.25. On Spike, COPS was at 0.24, compared to last week’s 0.30/0.28, and its GONE was at 0.18. History’s PAWN STARS was at 0.23. Food Network’s I HART FOOD fell 0.05 to 0.21. On A&E, INTERVENTION shed 0.02 to 0.19, and ESCAPING POLYGAMY was down 0.07 to 0.18. TNT’s WILL gained 0.02 to 0.10.